The effects of winter will vary based on the climate in a particular area. Certain places may be colder if they are in northern areas. This means extreme cold may potentially occur from time to time. People are able to layer to keep warm, but this is not possible for animals on a farm or homestead. The ability to ensure farm animals are warm during cold weather may mean a creative solution is necessary. Most people will try to keep animals in a barn or other structure that is heated. However, some animals may need to be kept outside and means the cold may be a significant issue. 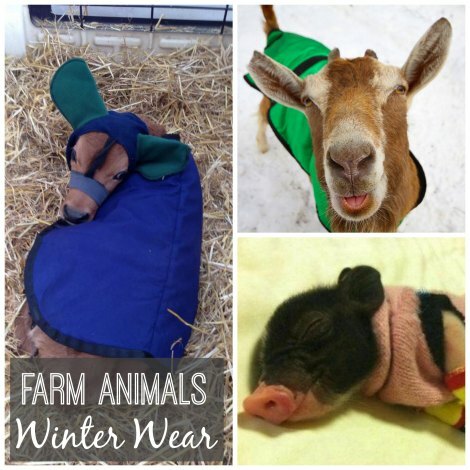 One novel idea is to have a variety of winter wear created for your farm animals. This is a similar type of clothing or outer wear that you can put on a family pet when outside in the cold. The goal of providing outer wear for farm animals is to keep them warm and not to display a new style of fashion. Basic materials can easily be made into clothing that can be used to keep an animal warm if cold weather is expected in an area. The type of outer wear you need is based on the type of farm animals on your homestead. Many types of fabrics and material can be purchased to make outer wear for farm animals. This means you may need to research the pros and cons of certain types of garments. You may find one might work better than another. The best thing to do is look for material that is made for sub-zero temperatures. Natural materials work better than synthetic materials depending on the quality and price. All you need to do is determine the type of garment that is necessary. You can easy make a vest or a coat for some of the farm animals on your property.